It was a Monday afternoon – last Monday afternoon, to be precise. I found myself standing at a lectern looking out over the faces of friends, family, and familiar strangers. My eyes where a bit scratchy, no doubt due to the flowers arrayed on either side of the stage. My hands shook slightly as I arranged the papers containing my remarks for the afternoon. I steadied myself in front of the microphone, closed my eyes for the briefest of moments, took a deep breath, and began to give a eulogy for my Grandmother – Mema. Mema had been struggling with cancer for the past few years. She fought long and hard but in the end, it was a losing battle. Still…she was at peace. We all had our chance to say goodbye. She lived a rich and full life, and knew that my grandfather was waiting for her on the other side. When she finally passed and we flew home for the funeral I, for the first time, really understood what it meant to celebrate someone’s life instead of mourning his or her death. There was still sadness and there were still tears, but it was different somehow. When my grandfather passed away two years ago, I wrote about him here on my blog. I did the same when my cousin Emily passed away last year. I did it for myself – to make sense of my feelings – and also to share some of who they where with all of you. Mema always loved what I had written about Papa, so when I came home to visit her before the end, she made a request. She wanted me to write something about her as well. But, she didn’t just want me to publish it – she wanted me to read it at her funeral. I had never spoken at a funeral before. The responsibility that came with the request overwhelmed me for a bit. It’s one thing to write something in solitude, in the time of your choosing. It’s quite another to prepare those remarks ahead of time, then stand in front of friends and family to deliver them. I’m no stranger to the stage or public speaking, but this was something else entirely. This was real, in a way I had never encountered real before. Truth be told, I shied away from writing anything for a while. The little boy in me thought if I didn’t write anything, she wouldn’t die. But the world only works that way in movies and fairy tales. Her health quickly got worse, and within a few weeks I received the call I had been dreading from my Mom. Mema was gone. As I sat on the plane heading back home for the funeral, I began to gather my thoughts. Images and memories swirled in my head as I tried to corral my emotions. I wasn’t really sure where to start. I wasn’t sure how long to speak. I wasn’t sure if I should be funny or serious, or both. The only thing I was 100% sure of was that it was something I had to do – both for Mema and myself. Deep in my heart, I knew what needed to be said and I had to trust that the words would come to me. And they did. I want to share those words with all of you. I can’t say it any better than I did on that Monday afternoon. I was fortunate to have all of the time I had with Mema as part of my life. She was a strong, caring woman and she will be missed. Mema – I love you and I hope I made you proud. A few weeks ago, I came home to visit Mema. Her health was getting worse, and I knew I needed to see her before the end. While I was here, we had a chance to talk and visit – and she had a request of me. She wanted me to write something for her and speak here at her funeral. I agreed – not knowing how difficult it would be to find the right words to mark this day. But she was always there for me, so here I am today. When I think about Mema, I think about many things. I struggled to decide just what memories to share with you all today. Laughter around her kitchen table. Time spent playing Canasta or Scrabble or Farkle. Birthdays, Christmases, Thanksgivings, weddings, and yes, even funerals. They all held something special, but I kept coming back to one simple thing…one thing I think about most when I think of Mema. That thing? Strawberry cake. There are few things closer to heaven in this world than Mema’s strawberry cake. Papa could cook a delicious meal, but I always looked forward to that cake the most. Others could make strawberry cake, but there was something special about Mema’s. To say that it was rich would be an understatement of epic proportions. The cake was always moist and tangy – and the icing was so creamy and decadent, it would almost burn your tongue with sweetness. Birthdays, Holidays, even just a random Sunday afternoon – I was always looking for an excuse to ask Mema to make a strawberry cake – and she was always happy to make one for me. The thing was – Mema was always trying to get the cake right. Sometimes, the icing would refuse to set and you would have a puddle of strawberry flavored goo around the plate. Other times, it would set too much and crack like an old piece of leather, left too long out in the sun. On more than one occasion, I would be treated to a toothpick or two in my slice, because the layers of the cake had refused to stay together. No – she didn’t always get it right – but it was always perfect. As I’ve looked back at everything over the past few days, I realized that Mema’s life was a lot like her strawberry cake. It was filled with goodness, it was made with love, and it was a blessing to us all. She didn’t always get it right (none of us do) – but she was the perfect daughter, sister, wife, mother, grandmother, and great-grandmother we all needed. Our lives (and our stomachs) were more full because of her. On the plane ride home this weekend, it really hit me – I won’t ever get to taste a strawberry cake made by Mema again – just like I won’t get to see her again. But as I sat with that thought for a bit, another thought came to me. I won’t have a cake made by her again, but I will have strawberry cake made with her recipe. And while I may not see her again – I’ll see the echoes of all the good she left behind, every time I look in the mirror. In the end she wanted nothing more fervently than to make sure we knew how much she loved us and that we would all take care of each other when she was gone. We do and we will. When Mema asked me to speak today, she also told us all that she didn’t want a long service. I’m going to honor her wishes, and leave you all with just one more thought. It’s a thought that’s made the last few days not ones of sorrow in my heart, but ones of rejoicing. I don’t know for sure what heaven looks like – none of us do. But I do have idea. 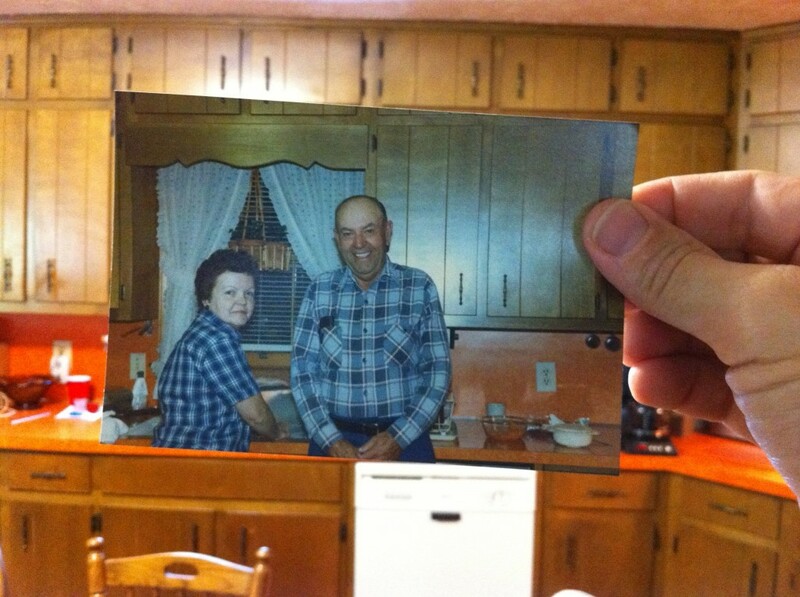 I think heaven looks a lot like Mema and Papa’s kitchen. I think Papa is there, standing at the counter, frying some potatoes and keeping an eye on the pressure cooker filled with ham and coca cola. I think my cousin Emily is sitting at the table, telling Papa all about her latest song and her dreams of the future. On Friday afternoon, Mema walked in to that kitchen. Then, after all the tears were dried, I think Mema went to work making a strawberry cake. I don’t know if it turned out right this time, but I know it was perfect. And one day, hopefully a long time from now, when I walk in to that kitchen – I know I’ll be greeted with hugs, and laughter, and tears, and stories – and a slice of Mema’s strawberry cake. I can’t wait to taste it again.